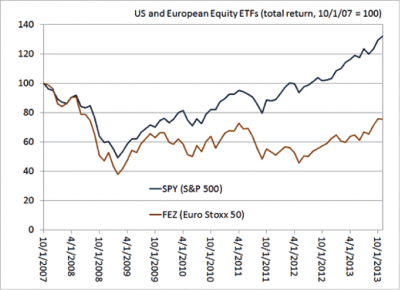 For the last four years US stocks outperformed European equities (and much of the world outside the US) by a large margin. Investors may conclude that investing abroad, even in the name of diversification, is nothing but a waste. But this may be a mistake. The very wide gap between US and European stocks seems overdone. US stocks have climbed to unprecedented and precarious levels while Europe has improved on many fronts without much effect on equity prices. This could be the time to diversify away from US stocks, and Europe seems to be the appropriate choice. Europe has been in a rout. Much of this is due to German policies aiming at reducing fiscal imbalances in the Eurozone. In the last few years Germany has demanded fiscal rectitude from the European periphery, and to set an example it laid out plans to reduce its own small structural deficit. Predictably, Germany’s obsession with making Europe financially healthy also made it economically sick. Eight quarters of economic growth gave way to seven quarters of contraction. Over eighteen months ago I wrote a letter in the Financial Times suggesting that Germany should promote higher inflation at home than its Eurozone partners in order to spur a recovery in the common market. I pointed out that the higher wages that unions were demanding at that time provided an excellent opportunity to move in that direction. This was mostly a rhetorical argument given that Germany has been historically repulsed by inflation and there were no signs that this could change. But this week Olli Rehn, the big economic czar of the European Commission – a far more influential voice – said that “Germany should create the conditions for sustained wage growth … especially for low-wage earners” – in other words, inflate its economy, starting with higher worker pay, in order to “sustain domestic demand not only in the short term, but also in the longer term.” European authorities, it seems, are waking up to the damage that the economic divergence between Germany and the rest of the Eurozone represent to the area’s future. There is a bright spot in the latest inflation numbers, which show that Germany is losing competitiveness relative to the periphery as its prices have risen faster than in Portugal, Ireland, Italy, Greece and Spain (affectionately known as “PIIGS”). The bad news is that the PIIGS paid a high price for this relative correction, as all five economies shrunk in 2013 while Germany’s economy expanded. While internal imbalances in the Eurozone seem to be abating, in the last 12 months the euro appreciated against the US dollar by more than 5%. This means that European goods have become more expensive – i.e. less competitive – in the international arena. The question, then, is whether Europe is better off because it is finally addressing its internal imbalances, or worse off because it is losing competitiveness abroad. The answer depends on whether Europe can grow. The most recent growth numbers came below expectations, showing that the Eurozone economy shrank by 0.4% in the last 12 months. This triggered many bearish calls for European equities. 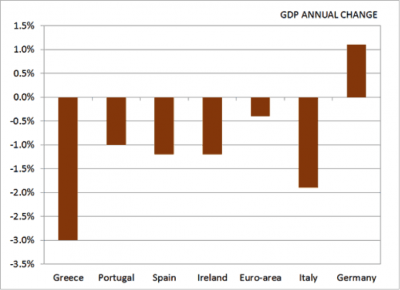 Yet, this is the best result in 6 quarters not just for the Eurozone (see graph above) but specifically for Spain, Italy and Germany. Portugal’s numbers are even better, as they are the best in 9 quarters. Greeces’s are the best in 12. Additionally, while the euro has surged against the US dollar, the trade balances of each of these countries, including Germany, have been trending up for the last couple of years. 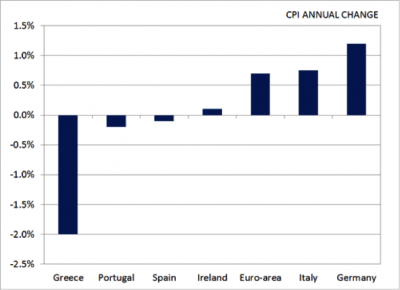 One of the gravest dangers that Europe faces today is that inflation is falling rapidly. If this turns into a deflationary spiral, the fragile signs of economic improvement will suffer a mortal blow. On the bright side, monetary authorities seem keenly aware of the deflation threat. The unexpected rate cut by the European Central Bank and Mr. Rehn’s pronouncements suggest that authorities in Europe no longer fit the caricature of head-in-the-sand, do-nothing bureaucrats. A new realism seems to be taking hold. Therefore, despite four years of underperformance, Europe may offer a decent opportunity to diversify away from a US stock market that may have gone up too far, too fast (see our previous newsletter, “Don’t expect a bull market in 2014”, 2013-10-28). This will depend on the extent that Europe can revive and consolidate economic growth, reduce divergence between Eurozone countries, avoid deflation, and make substantial progress towards fixing its banking system. It is a long and complex set of issues, to be sure. But there are signs that Europe is finally rolling up its sleeves to confront them. To the extent that investors may want to be exposed to equities, European stocks could be a better choice than US stocks in 2014 if the huge gap between them starts to close.